You can read part one here, and part two here. First match: System 2 19:20 vs. Northern Coalition. It is rumoured that PIZZA have been struggling to put together a team this year. On TQ, PIZZA live in Delve, and while not particularly impressive in a straight up fight, there are few groups who surpass them in catching stragglers to fleet, blopsing on ratters and general guerilla warfare against those who stage too close to Delve. Never under any circumstances look at their killboard (don’t say we didn’t warn you. /ed). In ATXI they beat Dead Terrorists in the first round before being knocked into the losers bracket by Agony, beating Heretic Initiative in the losers bracket and finally got eliminated by The Obsidian Front. In ATXII PIZZA entered as part of Pasta Syndicate, where they beat Affirmative and Choke Point handily before losing to Exodus., a newer but very strong tournament team. In the losers bracket they beat The Fourth District but then lost to Test. I have a feeling NC. are going to put up a reasonable fight, but if I had to pick a team to bet on in this first match, it’d be PIZZA. First match: System 1 17:20 vs. Project Mayhem. CVA are one of the oldest surviving alliances in the game. Continuing project deliverance in their forever-home of Providence, CVA are also famous for being the only major NRDS (rather than NBSI) group in the game. CVA only started participating from ATVIII however, so their history in this context is somewhat shorter than other alliances several years younger than CVA. ATVIII: Made it to Ro8 beating The G0dfathers and Agony Empire before losing to finalists HYDRA RELOADED. This is actually a very impressive run. ATX: Lost to Gypsy Band and Noir. ATXI: Dropping matches only to seriously good teams in RONIN and Darkside., CVA took out R.E.V.O.L.U.T.I.O.N, Perihelion Alliance, Circe-Of-Two, Transmission Lost and SCUM. ATXII: Beat Red Alliance and Outbreak. before being put into the losers bracket by HYDRA, then losing to The Afterlife. Whatever you may think of CVA on TQ, they are a legit AT team. Not top tier for sure, but a strong mid-tier team that can play out meta setups as well as bringing original creations such as the infamous Damnation Sacrilege team, where every the opposing target-caller is made to feel like he only has terrible options for primaries. Other than this, CVA also showed some skill in using last years standard Sleip/Gila team. I don’t think Project Mayhem should be too much trouble for CVA in their first round, but they’ll have a rough second round in (likely) facing The Tuskers Co.
First match: System 1 16:20 vs. The Bastards. The Dead Terrorists are an old group of pirates who tend to hang around Hagilur. I interviewed them last year for ATXII and they’re one of the most chill lowsec groups I’ve ever interacted with. Most of the year they’re a little inactive; a little gatecamping here, a little BlOpsing there. They have the ISK and the resources to generally do as they please, especially now in the post-Phoebe world of not having to worry about PL taking the cyno superhighway to them every time they want to break into the capital cabinet. Dead Terrorists are a pretty historied AT group, the tournament brings the core of them back together and active each summer. They have a somewhat relaxed approach to the tournament, which is probably why they’ve never made a top 4 run, but they most years they manage to fare pretty well and were consistently been gaining ground in terms of performance each year until ATXI after which they seemed to have dropped the ball a little. ATVI: Beat Privateers then lost to G00DFELLAS. ATVII: Beat Kenzoku, then lost to Legiunea Romana and Manifest Destiny. ATVIII: Ro8, beat Ushra’Khan and BANE before losing to WE FORM VOLTRON. ATX: Beat SOLAR, Team Liquid and Gorgon Empire, lost to Heretic Nation and Exodus. ATXI: Lost to xXPIZZAXx and were eliminated shortly after by Sadistica. ATXII: Lost to R0NIN in the first round (no shame for any team), then eliminated Moist. before falling to The Fourth DIstrict. Last year they had their own pretty bold interpretation of the meta. Round one saw them bring one of the semi-popular triple-’Phoon teams, then an Eos/AF team with a ECMgu thrown in. Finally, they brought a throwback, no-logi missile-kite team of Cerbs and Caracals with a Claymore for links. Though they won the control war with damps exquisitely, they couldn’t break anything with the weak HMLs, and thus ended up losing the match to the mighty rail Astartes. Dead Terrorists field solid (if a bit idiosyncratic) teams, but through a mixture of bad luck and critical errors have really failed to show us their potential for the past few years. This year, they have a solid chance in their first round match with The Bastards., but will likely be facing tournament veterans Rote Kapelle in their second match if they manage to win. First match: System 1 19:20 vs. Triumvirate. Dream Fleet hold sov in Detroid. To my knowledge they make up some of the Russian bloc and I’ve fought their fleets during PL’s most recent contract in the east. In terms of the AT, Dream Fleet are pretty much a complete unknown (as far as I know, heh). It’s their first entry and they have pulled Triumvirate. as their first round opponents. Tri are not a top-tier AT team, but they’re close, so Dream really have their work cut out for them if they want to impress this year. Despite Drop the Hammer approaching their fifth birthday, this is their first foray into the alliance tournament. Until recently they had sov… somewhere? Their killboard shows them PvPing all over the south-west, so I’m thinking they either live in Stain or have moved into a wormhole. When I tried to reach out none of their listed diplos were available, so I’m afraid I don’t have much more to say about them. Their first round match is vs. TEST, which is far from the worst draw they could have had. TEST actually have a decent AT team despite their usual reputation for pride in incompetence on TQ. Best of luck chaps! Easily Excited are a PvP-focused alliance who spend their time in south-western lowsec, which tends to be a little quieter than it’s Factional Warfare regions in the north and south-east. Regardless, they seem to be managing to find plenty of killmails, and from what I can gather from their killboards they’re rather fond of camping the highsec gate in Ami. Easily Excited made their tournament debut by beating Moist. without losing a single ship from their maximum Vexor setup, supported by a Damnation, Oneiros and some AFs. Round two they lost to THE R0NIN in a triple-Orthus mirror matchup, a team no-one should feel bad losing to. In the losers bracket they beat Lowsechnaya Sholupen with a nice Caldari tinker team using Gilas, and then were eliminated by Test’s weird 10-man Vexor pseudotinker-thing despite bringing in their flag-Bhaal. The Flaghorn was unfortunately jammed into uselessness while TEST nuken the Oneiros, and thus dropped shortly after with no reps on field. AFter that, TEST cleaned up the rest of their team. I wonder if they’ll decide to fit some ECCM this year? I don’t think Easily actually performed particularly poorly in their match, it was more excellent target calling and some luck on jam cycles from TEST that let them win the match. Easily’ should be really pleased with the run they managed last year, and I’m very much looking forward to see how far they get in ATXIII. If you’re looking for a relatively unknown team with solid potential to put in a breakout performance this year, Easily Excited are a great choice. First match: System 1 18:20 vs. The Afterlife. 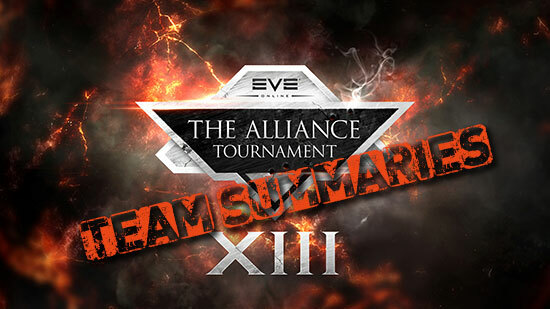 End of life are a highsec and wormholeing alliance making their third attempt at the Alliance Tournament. In ATXI they showed some promise, requiring the incredible AT teams of HYDRA and HUN to take them out of the running. ATXII wasn’t too great. In round one they lost to The Methodical Alliance’s Paladin-Rattlesnake team against their triple-Eos team. Relying again on the early meta armour-drone-comp they took their second match against The Nameless Alliance with a Stratios-Eos team against a fairly awful armour tinker (or meepo if we’re being technical). In match three, EoL brought one of the most common sights of ATXII in a Sleipnir/Gila team with Worm support, and were decimated by C0VEN’s take on a Gila comp using a Nighthawk, Cerberus and more damp support, being more of a kiting team. EoL, I hope you do well, but given that your first round opponents are The Afterlife. who made an amazing run last year, even I’m not that much of a believer. First match: System 1 15:20 vs. Suddenly Spaceships. Exodus. are an alliance who used to have a strong reputation for excellence in lowsec small-gang PvP. I’m not saying they’ve necessarily lost that skill, but you see their name being dropped fewer and fewer times in lists of the top small/microgang alliances in modern times. This can be attributed in part to the old TURN LEFT team, who joined Exodus. left again to form The Camel Empire (who are a pretty alright team), so there’s no doubt such a talent drain should have had some effect on teh strength of the remaining Exodus. team. Regardless, as an AT team they have had stellar performances since they first started participating three years ago in ATX. They made it all the way to the Ro4 beating Bruderschaft der Pilger, Agony Empire, Gorgon Empire, Dead Terrorists, Heretic Nation, Agony Empire (again) and Nulli before finally falling to Verge of Collapse, the winners of ATX. ATXI was arguably an even stronger performance, beating the likes of JIHADSQUAD, Exiled Ones, Transmission Lost, Late Night Alliance and even The R0NIN before being tag-knocked out by the two biggest names in modern alliance tournament history; HYDRA RELOADED and Pandemic Legion. ATXII saw a lesser performance from Exodus., though really the only way to improve would have been winning the whole damn thing. Exodus. started off well beating Ineluctable, Clockwork Pineapple and Pasta Syndicate before being knocked into the losers bracket by The Tuskers Co. Don’t get me wrong, The Tuskers proved themselves to be an amazing team last year by making it to the top four, but I would have expected them to put up more of a fight, especially with a flagship ‘Geddon against no flagship from The Tuskers. They lost the damp war hard, and after a little stalemate they just started dropping like flies. As Bacchanalian said in his commentary, Exodus. got handled by The Tuskers Co. – they were pushed around like a team much lesser than their previous results would imply. In the losers bracket their Gila/Sleip team, an archetype that had started to be discarded by that time in the tournament, lost to The Afterlife’s kooky Golem/Sabe/Jaguar team. It was said by all the experienced AT-ers in Iceland last summer (one of which I am not) that the top teams didn’t really get all that much better, it was the rest of the field that had seriously increased their game of the twelve months since ATXI. This was by all means a great run from Exodus. in ATXII, but it was not what I had expected from a team of their caliber. If Exodus. are not careful they will find themselves falling behind the curve and continue to post diminishing results. We can only hope that they have managed to foster and grow the talent that remains so they can keep posting the results they’ve had for the past few years.